"Some favorites from this well-established brand are their Moose Munch popcorn and perfect pears. They also sell wine, cheese, meats and more." "Besides food, snacks, and baked goods, they also have an extensive list of beer, wine, and champagne." "Hundreds of delicious baskets to choose from for any occasion or theme. One assortment includes a real Radio Flyer toy." "Brooklyn-based company that specializes in indie and small-batch foods...supporting artisanal producers." "They've got a wide range of non-perishable gift options like their Man Can (skin essentials) to the Bath & Body Birthday Invigoration." "Gift baskets, care packages, and other gift assortments...they also do "of the month" clubs for coffee, charcuterie, and fish." "Think one-of-a-kind cheeses, select olive oils, and specialty meats. You can make up your own gift basket with your favorite picks." "An Oregon company that has been in business for over 65 years. 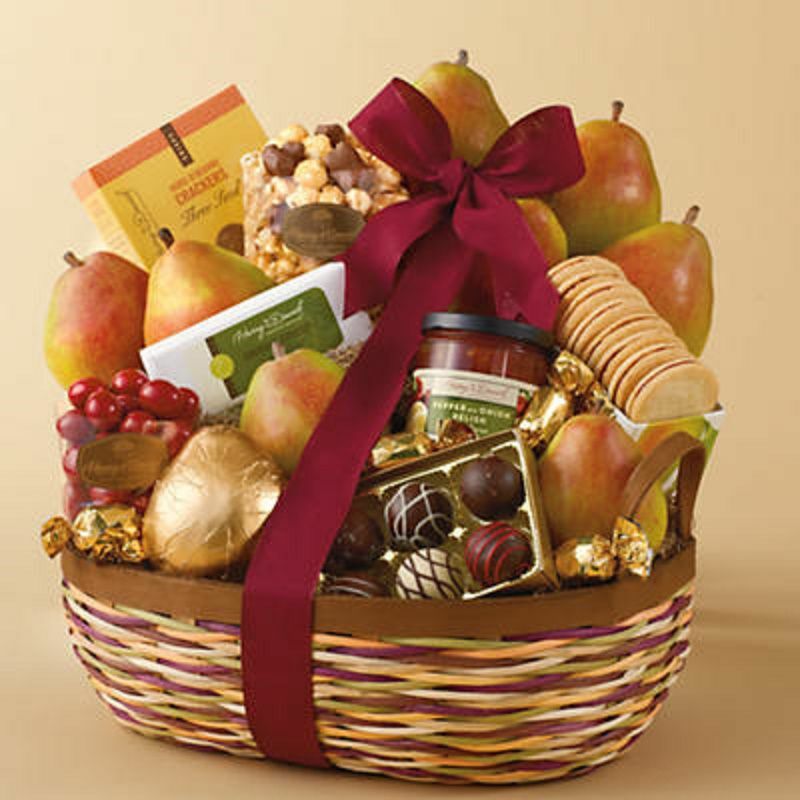 Their gift baskets are very affordable and feature the freshest fruits." In business for over 70 years, Harry & David is a well-known company that sells everything from delicious farm fresh fruit from their own orchards to delicious cakes, cookies, and chocolates. Some favorites from this well-established brand are their Moose Munch popcorn and perfect pears. You can get an array of different gift baskets depending on your taste, be that salty, sweet, or a bit of both. They also sell wine, cheese, meats and more so you can get someone (or yourself) a whole picnic. Looking for a wide range of gourmet food baskets, towers, cakes and more? Gourmetgiftbaskets.com has just that with many familiar brands like M&Ms, Chips Ahoy, and Late July chips. Besides food, snacks, and baked goods, they also have an extensive list of beer, wine, and champagne. You can get a basket filled with drinks and eats for any type recipient. If you are looking for a place that does it all Gourmetgiftbaskets.com does just that and at a reasonable price. This is another fine gift basket company with hundreds of delicious baskets to choose from for any occasion or theme. One assortment includes a real Radio Flyer toy and more. Mouth is a Brooklyn-based company that specializes in indie and small-batch foods. 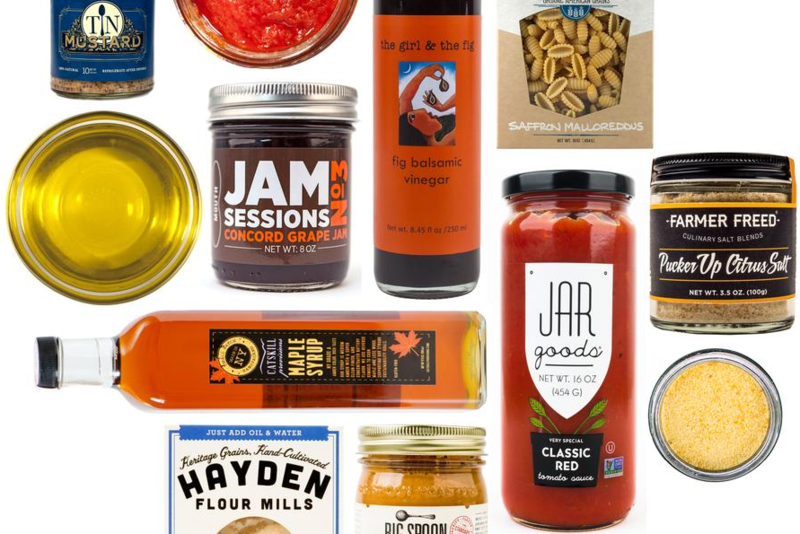 If your gift recipient appreciates supporting artisanal producers, these selections will wow them. Besides mouth-watering snacks, the site also sells alcohol and has eight different "of the month" clubs including Indie States of America and Bourbon of the Month. Curated gift baskets are Gift Tree's specialty with choices like their Full Leaf Tea Tasting crate (which includes a teapot and cup various teas and shortbread) and Toast of California Wine Basket (includes wine, nuts, cheese, popcorn and more). For those who want to go beyond food they've got a wide range of non-perishable gift options like their Man Can (skin essentials) to the Bath & Body Birthday Invigoration (various Burt's Bees products). The premier place for buying gourmet foods, Dean & Deluca has a wonderful selection of gift baskets, care packages, and other gift assortments. Only the very best of gourmet foods are used. Unique gifts like their spice rub collection are great for chefs who like to try top-quality ingredients. Besides gift baskets, they also do "of the month" clubs for coffee, charcuterie, and fish. If you are looking to impress a foodie friend, iGourmet might be the right pick. This site is a specialty food store that hosts gourmet foods from around the world including France, Italy, the UK, and more. Think one-of-a-kind cheeses, select olive oils, and specialty meats. You can make up your own gift basket with your favorite picks or choose from one of their premade baskets that will delight all tastes. An example is the Appetite for Antipasto basket that includes salami, provolone, a cutting board and more for a reasonable price. Fruit gift baskets are not created equal. The Fruit Company is an Oregon company that has been in business for over 65 years. Their gift baskets are very affordable and feature the freshest fruits, many accompanied with gourmet cheeses, roasted nuts, sweets, and other delights. The Fruit Company also has a variety of superb desserts and fruit-of-the-month clubs (be sure to check out the exotic fruit club).